Congratulations to election winners across our state and nation. Governor-Elect Gordon mentioned his desire to support education and stable education funding during his acceptance speech on Tuesday night. He served on the Johnson County School Board for a number of years. Personally, I am thrilled to continue my service to the state for another four years. I look forward to working with the new governor and with both new and seasoned members of the legislature. Education, as always, was a topic of campaigns nationwide. 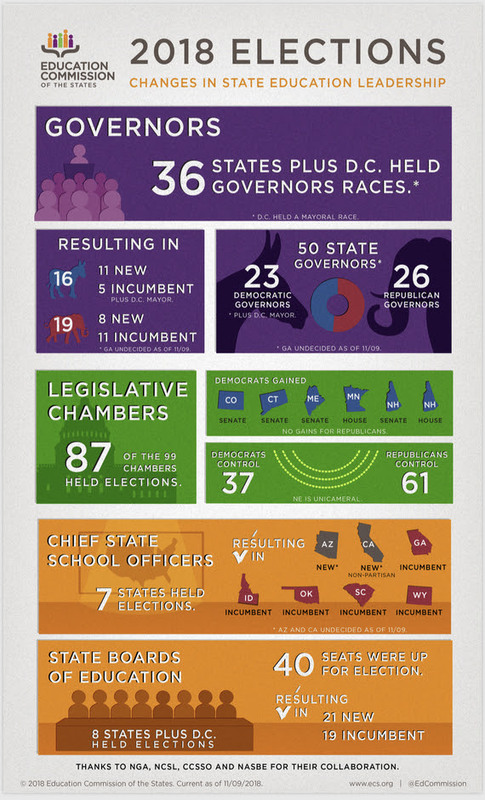 Election outcomes will impact state education governance in many state legislatures, state education agencies, and in the U.S. Congress. The Education Commission of the States tracked elections with an education lens and the outcome is depicted in the infographic below. 25 school leadership teams participated in the first Leadership Coaching Academy session this week and focused on developing a Culture of Collaboration and Ensuring that Students Learn – two of the “big ideas” that represent the core principles of Professional Learning Communities. The State Superintendent’s Policy Summit (S5S) is being restructured to provide training on the 25 components of Wyoming Accreditation. It will not be held during the 2019 legislative session as in the past. Information on the 2019 S5S will be shared at a later date.